I’ll admit I was not a fan of “Batman: Eternal” when it first came out. I knew it was another ploy to get me to pay $3.99 a week for a rushed comic. For those of you who don’t know, the storyline for this weekly (one year) series is horribly generic. Commissioner Gordon is framed for causing the death of several hundred people on a subway while gang wars break out throughout Gotham. Batman must race against the clock with the help of Jay Bard (a new addition to GCPD) to save his friend and protect the city. To me, it sounded like a revamp of the Batman: Animated Series episode “Shadow of the Bat” where Two-Face and Lt. Gil Mason frame Gordon for bribery. While I did pick up the issues every week (being a loyal Bat-fan), I found them dull, the characters boring, all in all a lackluster project. That all changed this past issue. “Batman Eternal #18” was an amazing issue because it went beyond a mundane storyline. Rather it provided some very interesting social commentary. Social and philosophical commentary is not uncommon in DC comics and when done well, can actually be really amazing (take the Joker’s monologue in “The Killing Joke”, or Lex Luthor’s epiphany in “All-Star Superman“). So without giving too much away, I want to look at this rather unique issue. The issue starts in Brazil where a boy is carrying Batman figurines. He laments about how he makes these toys everyday but that “Bat Vampire Man” never comes to save him from his life of slavery. Despite the creation of Batman Inc. (founded by Bruce in order to place a “Batman” in every major area in the world), crime still continues. In these few panels, the writers displace the reader, making them reflect on the realities of child-slavery. In other words, fiction provides an analogue to reality and like Batman we are unable to control these horrible crimes. 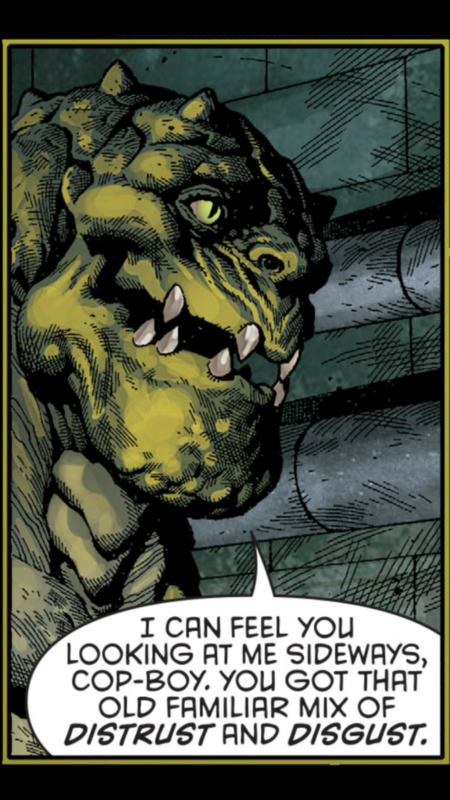 Another example of commentary can be found in the feature character of this issue, Killer Croc. While Waylon Jones used to be just another meta-muscle in Batman’s Rogue’s Gallery, the New 52 has painted him to be something far more. 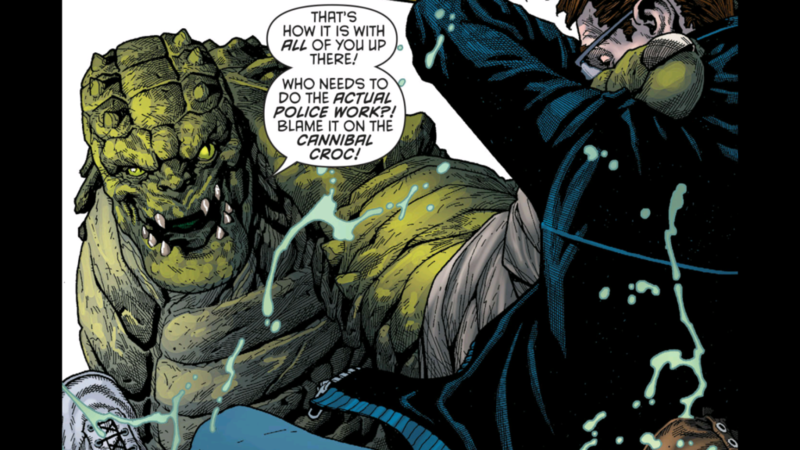 Killer Croc is now a commentary on class relations in our own society. While Croc has always been identified ethnically as an “African-American”, he is now the defender of the Gotham homeless. He lurks the sewers protecting those that fall out of Batman’s (and the police’s) view. Croc enters the story when Bard and Batman see a homeless father and daughter looking for medical help disappear into the sewer. Batman and Bard follow them and find the father with his face ripped off. Suddenly, Croc appears and Bard tries to place him under arrest for murder. Croc flies into a rage after this, claiming the man and girl were his friends. He accuses Bard of over simplifying the situation, claiming it is easier to blame “Killer Croc” than it is to do actual police work. In many ways Croc expresses what happens so often in our own society. The police find it easier to profile certain ethnic or social groups, purely because of appearance. While Croc has done nothing wrong (and tried to help), Bard immediately suspects him. This is very similar to stories about police gunning down innocent people because they “think” they have a gun due to stereotypes(take the recent Ferguson, Mo. incident). The issue also highlights the general disregard for the disenfranchised. That even Batman, the Dark Knight, Defender of Justice, is blind to what happens in the Gotham sewers. I am not a political person. I am not trying to cram doctrine into my article. However, I would be remiss in my duties as a writer if I did not address several points. I feel that the writers are using social problems to give the stories a greater sense of dynamic and reality. Media is the catalyst of social change. Whether or not these writers are trying to make social commentary is irrelevant. They are merely painting a picture for us, so that we can take from it what we choose. So give it a read. Is this issue really about social commentary? Am I reading too much into things? Let me know!